Banners of Progress: Students help artisans turn trash into must-have accessories. 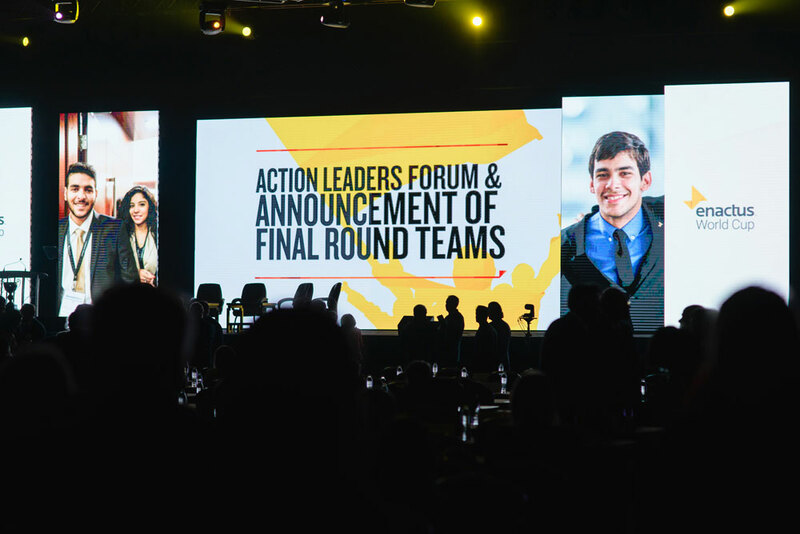 On Friday afternoon, the top four Enactus teams in the world took to the main stage in Beijing to once again tell the story of how they looked at the world with a new perspective and used the power of entrepreneurial action to make a real difference in the lives of others. But as they gave their presentations, they were representing more than just themselves. 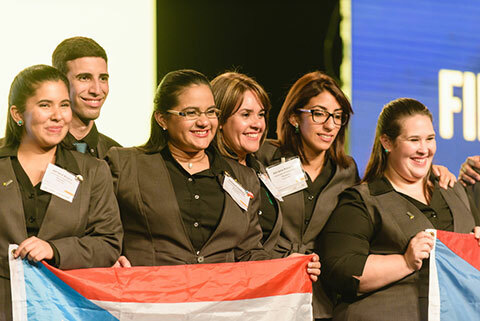 They were representing all the Enactus students around the world who this year invested countless hours to improve their world. They were representing the people whose lives have been forever changed by their efforts. They represented the dedicated faculty members whose guidance has been crucial to their work. And they represented the thousands of companies, organizations and universities that give both time and money to support the teams. While the competition is what brings us together, at the heart of the event is the opportunity to celebrate and recognize our whole network and the power we have when we realize that the world is ours and we can make it better by seeing opportunity, taking action, and enabling progress. We started today with the semi-final round of competition, where 16 teams gave their inspiring presentations in hopes of moving forward to the final round. 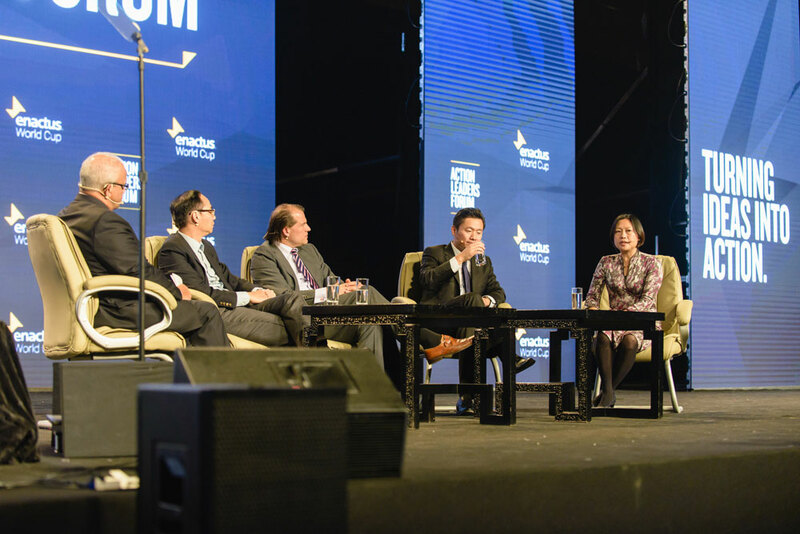 At the same time, our top executives gathered for the Top to Top Forum, a unique networking and learning session where they explored how Chinese and foreign companies can collaborate to succeed in China and oversea markets. The second day of the World Cup Sponsor Fair also took place in the morning, which gave 12 of our generous sponsor companies the chance to showcase their products, services and corporate culture to students from around the world. At 1:00 pm, the nearly 5,000 people in attendance met in Plenary Hall for an exciting afternoon of main stage events. We started with the second Action Leaders Forum, which was again expertly moderated by Lord Dr. Michael Hastings, Global Head of Citizenship for KPMG International. Our panelists were Kees Kruythoff, President of Unilever North America; Kent Wong, Managing Director of Chow Tai Fook; Arthur Wei, CMO of Lenovo China; and Hui Huang, CFO of RenRen, Inc. With such diverse companies representing consumer products, jewelry, technology and social media, the discussion was engaging and robust, covering topics such as eliminating poverty, bridging the digital divide, and empowering women. The panel also fielded questions directly from students, resulting in an informative exchange with practical information that can be used by teams around the world. You can watch the forum in its entirety here. Next up was the announcement of the final four teams. You could feel the anticipation in the air as all the attendees, but especially the semi-final teams, waited to learn who would take one step closer to winning the World Cup. After a close competition, the teams from Ireland, Morocco, China, and Puerto Rico were announced as the finalists and chose their time slots for the final presentations. The final round of competition started with the team from Ireland representing University College Dublin. They focused their presentation on their Generation Accommodation project, which aims to bridge the generational gap by pairing socially responsible students who need somewhere to live with senior members of the community who want to rent out space in their homes and earn additional income. Different from your typical rental agency, the project employs a unique matching process that facilitates a seamless process to take the needs of all participants into account. Perhaps most impressive is that Enactus Ireland was founded only two years ago, and this team has only been active for nine months! Next up was the Enactus team from Mohammadia School of Engineers, representing Morocco. In the school’s second World Cup showing, they impressed judges with projects such as their Access Water project, which addresses the challenge of clean drinking water accessibility by delivering water purification systems to those in need. The product they developed costs less than $10 and has the potential to go far in addressing access to safe drinking water, a serious issue that affects nearly 1 billion people worldwide. 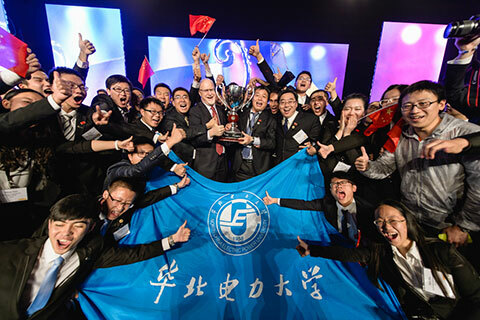 After a short break, the home team from North China Electric Power University took the stage in their first World Cup appearance. They shared their work with rural herdsmen to increase their access to electric power. The team completed field research and created a company to address the safety and environmental risks of using cattle and sheep dung as fuel for kerosene lamps. They now have access to 33 times more power, allowing them to use electric light and equipment that increases work productivity and dramatically improves their living conditions. And in the coveted last slot was the team from the University of Puerto Rico, Mayagüez, who shared numerous initiatives including their Limitless project, a program that connects visually impaired people with suitable training and job opportunities. This year they opened a company that provides more than 20 jobs to legally blind individuals, earning them recognition and support from the government. Working with this target audience has been inspirational, reminding them that human potential truly is limitless. When you watch their presentation, take note of the presentation team’s outfits – the clothing was made by participants in the project! While the results were tabulated, the Final Round Awards Ceremony kicked off with an impressive performance by Momo Wu, the Lady Gaga of China. 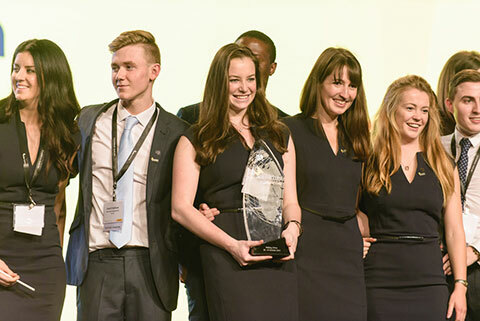 This was followed by the recognition of all of our Enactus country leaders, and the presentation of the Jack Shewmaker Leadership Award to Jim Ineason, Country Leader for Enactus United Kingdom. 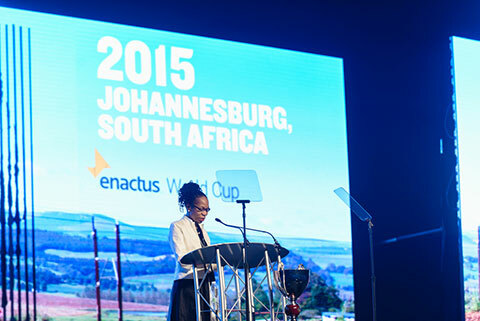 Enactus’ President and CEO, Alvin Rohrs, then gave a brief address and the location for Enactus World Cup 2015 was announced: Johannesburg, South Africa, the first time the event will take place in Africa. 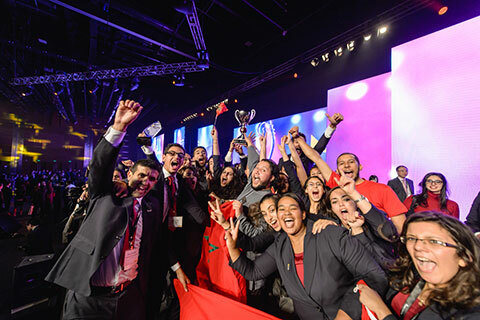 Finally, it was time to learn who would take home the Cup, and it turns out they won’t have far to travel with it: our host country, China, was announced through the roar of the crowd as the 2014 Enactus World Cup Champion, with the team from Morocco finishing in second place. As we close the book on our 14th World Cup, we take the time to reflect on the incredible accomplishments of the past year while looking forward to all that is to come. Congratulations to all the students and a huge thank you to our host country, China, and all of our sponsors who made the event possible. Together, we will continue to see opportunity, embrace the power of entrepreneurial action, and make our world a better place for all of us.